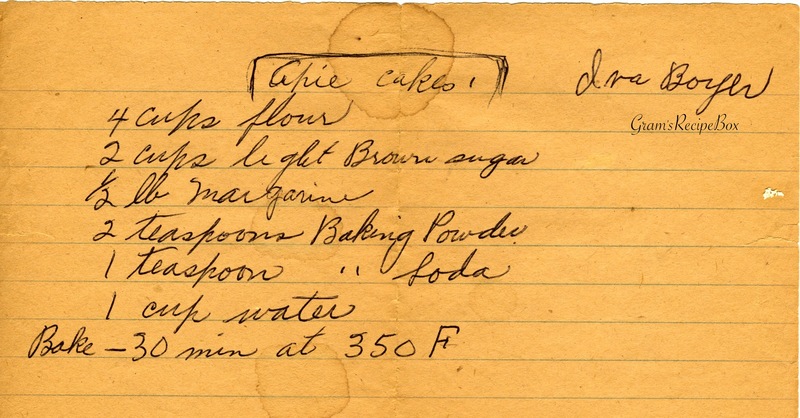 When I first read this recipe I thought it said “apple cakes” but looking again I see it says “apie cakes.” I don’t really know what exactly an apie cake is, but I did find another recipe online called apie cakes and that site has it categorized as a breakfast and a dessert item. Hmmm. This recipe was in the same packet as our Farmer’s Record was, so I assume it came from the same household. Also, the word “teaspoon” is spelled out rather than abbreviated. Hmmm. There’s no honey in it, otherwise I’d think it came from “Apis” (bees). Maybe it originally came flavored with honey? I was searching on Google for an apie cake recipe, and this is the only place I’ve been able to find it so far. Funny that the poster isn’t familiar with them herself. Growing up in Pennsylvania Dutch country, apie cakes were one of my favorite things my grandmom used to make for me. (Second only to Shoe-fly pie!) I never realized that they were a PA Dutch thing until just now trying to find this on line. Andi’s post seems to confirm that. It’s a simple cake, so great if you’re not into overly sweet desserts. They can be a little on the dry side, so as a kid I used to smear butter on it! haha Not sure if I would do that now. I reckon Andi’s style of dipping in milk is probably more traditional. search for AP cakes too. that’s what we call them in my area of PA Dutch country. Many thanks to my grandaughter Olivia for sharing this with me. I remember growing up in Eastern Penna, my birthplace, and fond memories of the aroma from my mother baking apie cakes. It was a family tradition to eat and enjoy apie cakes. Several bakery’s in the small town made apie cakes and sold them in small corner grocery stores. I still have my mother’s original recipe which is very similar to the above recipe. My grown grandchilren still ask me when I’m going to make Apie’s again. It is and always will be the coffee and milk dunking pastry in my life. I know you will enjoy them. Bob thank you for your great memories of apie cakes! A good friend of mine tried them and she loved them, as did her 2 year old son. It looks like I will be trying them as well! I was wondering if you would share your mother’s recipie? I just love apie cake! Having grown up in Pennsylvania, we had them all the time. Now living in San Antonio, Tx, apie cake is a culinary alien. Thanks for the stroll down memory lane. Fond memories of apie cakes growing up in Pottstown, PA! My grandmother used to make these cakes and how wonderfully delicious they were dunked in milk, coffee or just as is. Many of the small local grocery stores near Pottstown used to carry these wonderful cakes but as time went by, they closed and apie cakes are nearly impossible to find. Living now in the Philadelphia area, nobody has no clue what an apie cake is, and I would love to enjoy this memory of my childhood again. Will try your recipe with one question, what type of pan to you bake the cake in … 8 inch or 9 inch cake pan and does it make more than one pan? Thanks!! Hi Judy – I have not made these yet. A friend did and I will have to ask if she remembers what size pan. I think I’d probably see what the amount of “batter” looks like and wing it, lol. I was born in Pottstown, Pa and my mother made apie cakes every Saturday!! Now my daughter is requesting those cakes for her 39th birthday!! I was so excited to see all the Pottstown people and their memories!!! We are living in Florida now and they are hard to find. So I looked online for a recipe and found these comments. Fond memories! Thank you! JUDY!! Oh My gosh! !What is your families surname ? ?I was looking up APIE cakes because I was remembering visiting my grandparents in POTTSTOWN and they always had this to eat in the kitchen and they and my mother always dunked it in coffee!! !Memories…and no one has any idea what I am talking about unless they are from that era and that area!! I’m another Pottstown native (north end) ! My family always got ours from Rosenberry’s grocery. Frank Rosenberry had his own bakery across the street, and to get one on Sunday after church when they were still warm from the oven was really a treat. Thanks to Mrs. Marvel for the recipe ! These are easy to make great cakes usually used like a coffee cake with morning coffee., you can try light brwn sugar and then dark brwn sugar and if you want you can use a cup of brwn sugar and a cup up Stevia a natural sugar better for those watching their sugar levels…. Use a standard 8 or 9 inch pie pan they will rise to about 1 -1/12 the original thickness. My grandparents and mom are also from Pottstown and I grew up on apie cake from Rosenberry’s! Yes, dunking. Yes, butter. Breakfast, late night…anytime. Not too sweet Just delicious. Wonder if this recipe will come close. Wow!Sounds like my life growing up!We were the Hartmans on Rosedale drive!or Burdans!I miss the APIE cake so much! I live near Bally PA. Apie cakes are GOOD ! Been many years since my mom would bake them. Really liked them the harder the better, but cant find a recipe that bakes them hard. With butter and than dunk them in coffee. Really good. Asked about funny cakes in the Amish country, didn’t seem to have heard of them. I just ate a piece of my Mom’s Apie cake. And decided to google it. I am from Gilbertsville which is next door to Boyertown and Pottstown. My grandmother’s maiden name was Weller. She lived in Boyertown. My favorite is the Funny Cake. This recipe is very similar to my grandmother’s Christmas cookie recipe, but I’ve been having problems with the measurements I’ve been given. Would anyone happen to have a cookie recipe with these ingredients, but using buttermilk instead of water? I’m going to attempt them using the above, but will sub buttermilk for water and see how they turn out. I hope you will love this receipe…my nana Florence Weller (married to Paul Weller) just made the best ones…for sure! It is snowing today and the baking gene grabbed hold of my apron strings wanting to bake some nostalgic Apie Cake! Thank you for sharing this recipe. I am originally from the Pottstown PA area and my PA Dutch grandmother would make this delicious treat! She told me when I was newly married that it was baked hard and dry because the women would fold up a hunk of it in a bandana hankie for the men to put in their overalls pockets to eat while they were out working in the fields on the farm. We would dunk it into a glass of milk, coffee, or tea. Yum! I tried this recipe and found it to be moist yet still solid for an apie cake. By the way, we pronounced it Ay-pee. My mom and grandmother made these EVERY CHRISTMAS and they “cakes” were actually baked in a pie pan. The dough was always thick and tough to stir so we stirred until our arms tired and then passed the spoon to someone else to continue. Mom also rolled the dough flat and made Apie Cake snowmen, Christmas trees, reindeer, bells, candy canes, and the diamond, spade, club, and heart shapes. I still have those cookie cutters. A great treat and an amazing memory. My wife and I are planning to start baking tomorrow. I read on another site that Apie Cake ‘s orginal name was A Pie Cake because it was baked in a Pie Pan! Don’t know if it’s true, but an interesting tid bit. My husband grew up eating Apie Cake and remembers his great grandmother making it also!!! Talk about an old recipe! My husband grew up in Manchester, PA.
Great recipe for those of us that remember this as a kid. Thanks. My husband is from Pottstown and now living in Redding Ca. Yesterday I made 4 apie cakes for him and he has them for breakfast whenever i make them. It always pays to keep your hubby happy. Nancy Endy married to Robert Endy and 62 years of apie cake baking. Grew up with Apie cake. My mother was from Berks County, PA, and her maternal ancestors obtained a land grant from Wm Penn’s sons. Assuming this is of German derivation, as my mothercalways called herself Pennsylvania Dutch.